They say a picture paints a thousand words. Which can only be good news if you're a time-pressed academic such as myself. This post introduces a new feature - image of the day (or week or month, depending on how often I'm able to post.) Each time, I'll post a single image that will, hopefully, say a thousand words about unconventional gas extraction in the UK. First up, an image from the 2013 Davies et al. paper on induced seismicity. The bar chart shows the magnitudes of earthquakes triggered by human activity in the subsurface. Many human activities can trigger earthquakes, including hydroelectric dam impoundment, geothermal energy, coal and mineral mining, waste fluid re-injection, conventional oil and gas reservoirs, and of course, hydraulic stimulation. 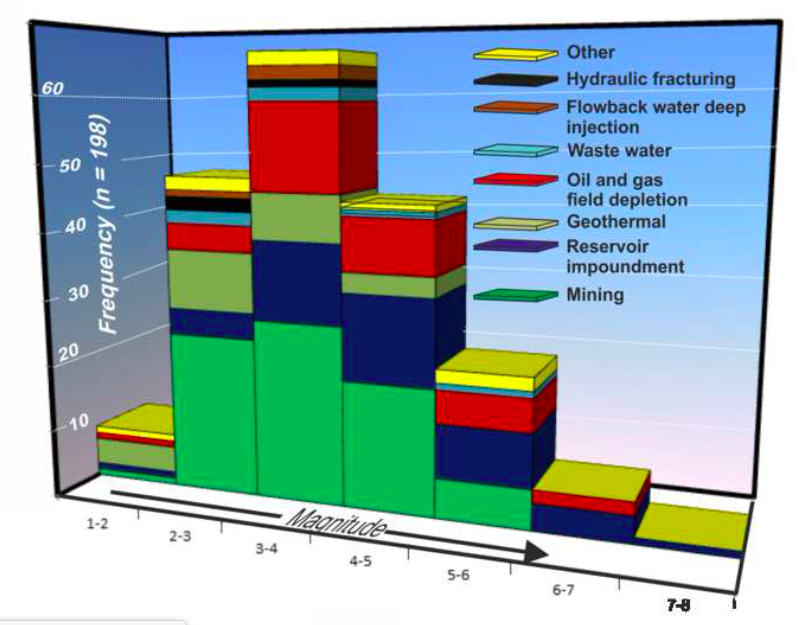 These activities are represented by the different coloured blocks - hydraulic stimulation is the thin black boxes at M = 2 - 3 (2 earthquakes) and M = 3 - 4 (1 earthquake). You can see how this compares with other activities. In the words of Professor Davies himself at the Unconventional Gas Aberdeen conference this week, "in terms of earthquakes, shale gas doesn't even make it into the premier league". Thank you, a very clear chart, I'll be saving it to my phone. My social circle are poorly informed about fracking but they know all the scare stories. Something similar showing the risks of water contamination would be useful. You could try looking on https://en.wikipedia.org/wiki/Hydraulic_fracturing_in_the_United_Kingdom I have been editing it to show proper science as I am sick of hearing non scientific nonsense. Please advise your friends as well!